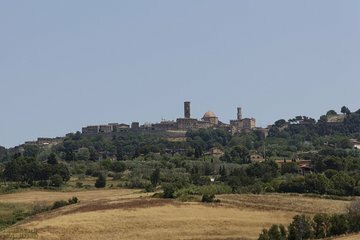 Bli kjent med Toscana gjennom å smake på viner og besøke den gamle etruskiske havnen på denne helgedagstur fra Firenze. Med en liten gruppe på bare 15 personer eller færre, lær om "super toskanske" viner fra guiden din og besøk Populonia, en stor etruskisk port. Andre høydepunkter inkluderer besøk til Volterra, Suvereto og Bolgheri. Turens lille gruppestørrelse sikrer personlig oppmerksomhet fra guiden din. Lett lunsj og smaksprøver på en vingård inkludert. I booked this tour because my mother and I wanted to see a typical Tuscan village and visit some of the less touristy towns of Tuscany! The tour company, Tuscan Travellers, asked us well in advance how we would like to spend our day visiting as many cities as possible or including a visit to a winery. The towns that are included in this tour are simply charming. During November, we felt like we were the only tourists there! Our day began in the Estruscan town of Volterra a medieval hill town. We enjoyed strolling around the medieval narrow streets, breathing in centuries of history, with views of a Roman amphitheater and rolling Tuscan hillsides. In the afternoon, we made stops in Suvereto, Populonia and Bolgheri. These cities are all located along the Mediterranean sea and they are as precious as they are small. Perhaps the highlight of our day was our lunch stop at the Bulichella Winery. The vineyards extend all the way to Montepeloso and the sea the tour was very interesting and afterwards a lovely three course tasting and lunch was included. Our driver, Jonathan, was courteous, engaging and very dedicated to ensuring we enjoyed the day. Jonathan was a fantastic tour guide. He was very friendly and knowledgeable about the area. I highly recommend this tour especially if you can get Jonathan as your guide. The day was slow paced and relaxed. We visited a few towns and especially enjoyed Volterra. The visit to the winery was the highlight of the trip. The wine and food were absolutely fantastic!